The AA final in Tbilisi saw GB qualifiers Lucy Stanhope and Maisie Methuen return to take on the best juniors in Europe for a second time. Unfortunately there is no footage of the event up as yet, but Lucy sadly had to pull out of the AA competition after three pieces, leaving the floor warmup in tears, and not being able to complete her competition. Not the ending she would have hoped for at all, but we will see her back again, stronger than ever I’m sure. Maisie improved her qualification position from 16th to finish in 12th place, upping her scores on every piece but beam. 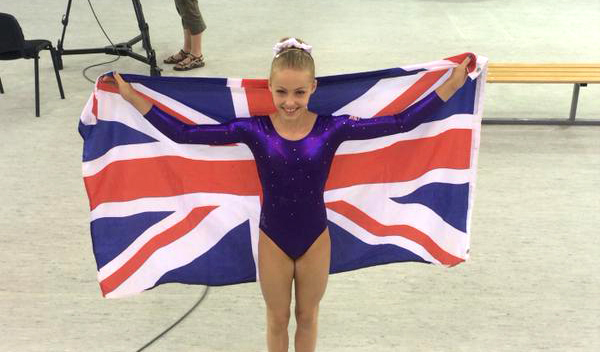 This year’s EYOF was predominantly comprised of 2000 born gymnasts meaning most will be seniors in 2016, Maisie is a first year junior, and finished second of the 2001 born girls, which bodes very well for junior Europeans next year. Maisie qualified to both vault and beam finals, for the vault final she competed her new handspring pike front half for 13.70, and followed with her lovely handspring pike front for 13.55 with a 8.950 E score. Finishing in 7th place in her first international final as a first year junior is a great result. Better still was beam, I think every time I have written about Maisie I have praised her beam work, and she really is hugely promising on this event. Although she had one of the lower D scores of the finalists, in qualification and finals she worked beautifully to earn the the second highest, then highest E scores. She has a new dismount that she didn’t compete here, and another year to add even more difficulty, with the same performance level could see a great result at junior Europeans. That’s all for the future though, today was all about holding her nerve, performing her routine, and earning the silver medal, a huge achievement for this talented young gymnast. No video available yet of her medal winning routine, I will of course add it should one pop up. So a mixed EYOF for our young gymnasts, but invaluable experience gained by all, ready to take forward to the next challenges. For Georgia the preparation to join the senior ranks next year, for Lucy and Maisie the road toward 2016 junior Europeans. Well done girls, we look forward to seeing you in your next competitions. August 2, 2015 in Reports.